I have found a novel that creeps me out almost as much as The Stand did decades ago when I was a teen. Nick Cutter’s The Troop is that book. Nick Cutter, in case you’re interested, is a pen name for writer Craig Davidson. For the most part, the characters are fleshed out enough. What’s intriguing about this novel is that Cutter intersperses news and magazine articles, blog posts, transcripts, other tidbits to help propel the reader along. Where this method fell short for me so far is in finding out how many of the characters survive their ordeal (spoiler alert: not many). The story centers around a small group of boys and their Scoutmaster on a camping trip in the Canadian wilderness. Throw in a diabolical scientist, a genetically engineered product of secret research, a vile nasty that causes its victims to become insatiably hungry before their hosts consume themselves, and the natural elements of the wilderness, and Cutter provides all the fixings for a horrorific tale. If I have one fault with the characterization so far (better than three-quarters of the way through the novel), it is the way Cutter provides a seemingly cardboard cutout of a police chief and his bully son. Such characterizations have become a trope of sorts; one, sadly, we have seen again and again. Still, the rest of the boys and Tim the Scoutmaster round out a rather convincing cast. Cutter acknowledges Stephen King and his novel Carrie as being “a great inspiration” in his writing. It becomes apparent while reading the novel where King’s influence has left its mark. 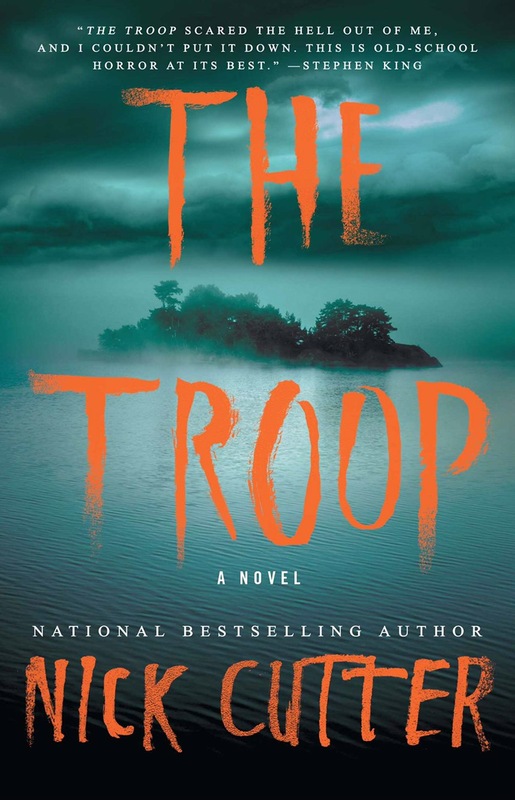 The Troop is one of those novels perfect for a summer read; unless of course you plan on vacationing in the Canadian wilderness. If you do, beware hungry strangers. Whatever the case, if you like a good horror tale in the vein of The Stand then try The Troop; even if you are creeped out by the prospect of contagions. That’s a nice recommendation. Thanks!